As Congress struggles to find consensus on a solution to provide protections for Dreamers, the Administration’s new family separation policy has started a political fire storm creating moral outrage across the country and in Congress. 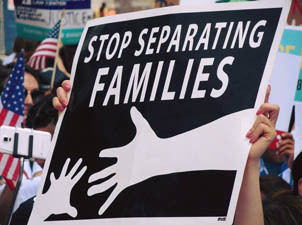 There are two bills that would end the practice of family separation and provide relief to impacted families: The Keep Families Together Act (S. 3036) and the Humane Enforcement Legal Protections (HELP) for Separated Children Act of 2018 (S. 2937/H.R.5950). NETWORK strongly supports these bills. The Keep Families Together Act prohibits the separation of families at the border. Senator Dianne Feinstein introduced this bill on June 7, 2018 and it currently has 31 Democratic cosponsors and no Republican cosponsors. The bill was created in consultation with groups who provide services to families at the border including Kids in Need of Defense (KIND) and the Women’s Refugee Commission. It mandates a prohibition on removing a child from a parent or guardian in an attempt to deter migration into the United States. It also provides a mechanism to reunite families who have been separated. Allowing parents to participate in proceedings affecting their children. Allowing parents to make calls to arrange for the care of their children and ensuring that children can call and visit their parents while they are detained. Protecting children from being forced to be translators for law enforcement when speaking to their parents. Ensuring that parents can coordinate their departures with their children. Requiring ICE to consider the best interests of children when making decisions on the detention, release, or transfer of their parents. The bill currently has 24 Democrats sponsors in the Senate and 16 Democrats sponsors in the House. With Democrats working to elevate this moral crisis to the public’s attention, all eyes are on Republicans for a legislative response. Protections for children have historically been a nonpartisan issue and thus these two bills should be supported by all Members of Congress. We must work to secure Republican cosponsors on these bills so that Congress can pass legislation to end family separation. The practice of separation is so morally corrupt, that even immigration hardliner Rep. Mark Meadows (R-NC) leader of the House’s far right faction called the “Freedom Caucus” has called the policy a “horrible law.” We call on Republicans to join their Democratic colleagues in ending the policy of family separation. NETWORK will continue to monitor legislation closely and provide updates on this issue. This entry was posted in Front Page, Immigration, Policy Update, Women and Families on June 11, 2018 by sana.